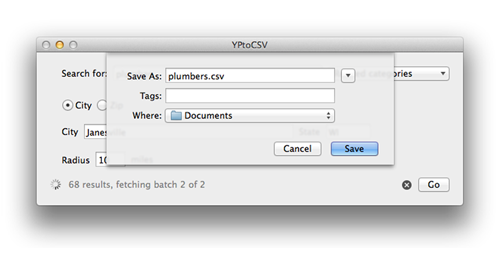 PeacockMedia: yellowpages to csv - new app! 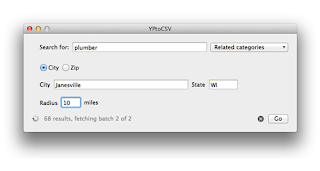 yellowpages to csv - new app! Users' needs are usually pretty specific. I wondered whether I could make a much simplified version of WebScraper, pre-configured to scan that particular site. It turns out that they provide an API, which changes the game. This app can be much more efficient. The trade-off is that there is a 'fair use' limit per API key, but this is very generous and the limit I've built into my app is pretty hard to hit. Yes, that's all there is. In return for such a simple interface, all configuration is fixed. It's locked to yellowpages.com and the output file is pre-configured too. For more flexibility (or to scrape a different site) please look at WebScraper.